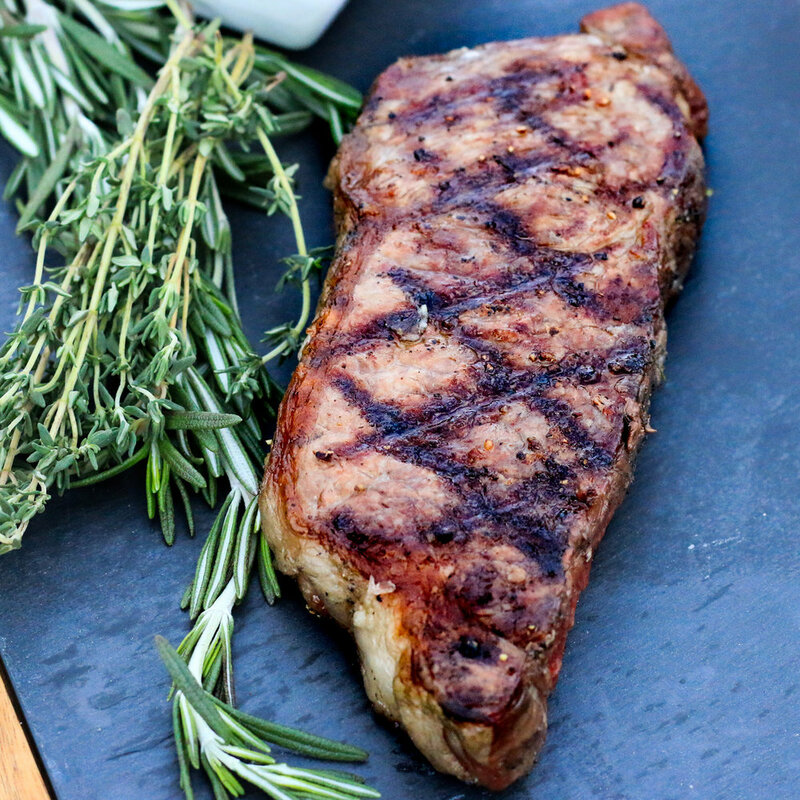 Grilling the perfect steak is an art but it’s definitely achievable at home! A perfectly grilled steak is a luxurious treat that is relatively easy to do on your own. I’ve listed a few tips in the recipe below that will help you get delicious grill marks while keeping your steak juicy and tender. You can substitute any cut of steak for the sirloin, you will just need to adjust the cook time depending on thickness. The best cuts of steak for grilling are: rib eye, t-bone, sirloin, flank, filet mignon, flat iron, porterhouse, strip, hanger, skirt. Whatever cut you choose, my advice is to fork out the extra money for a high quality piece of meat. The steak is the star of this meal, and if the quality of the ingredients is sub-par so will be the result. *Look for steaks that have been aged 21 days or longer, and that have nice marbling throughout. I always buy grass fed, hormone & antibiotic-free beef. Remove the steaks from the fridge and let them get to room temperature. This should take about 15- 20 minutes. This will help ensure that the steaks cook evenly. In a small saucepan, place the olive oil and butter over medium high heat. Add in the shallots and sauté until softened, about 3 minutes. Add the garlic, rosemary and thyme and cook until fragrant, approximately 1 minute longer. Add honey and stir until melted and then deglaze the pan with the wine, gently scraping the bottom of the pan with a spoon to incorporate any of the caramelized bits from the bottom of the pan into the sauce. Let the wine reduce by two thirds. Add in the beef stock, and let reduce again by three quarters, stirring often. Season with salt and pepper before serving. Preheat the grill to high heat. Ensure the grill is clean and has been oiled/greased. Brush the steaks with the olive oil on all sides and generously season with sea salt and fresh cracked black pepper. Place the seasoned steaks on the hot grill and don’t touch them, except when it’s time to flip! The more you poke and prod the steaks, the more juice you will lose and the less defined grill marks you will have. The grill marks are packed full of charred flavor and therefore are essential when trying to achieve the perfectly grilled steak. A general rule of thumb is to cook your steaks for approximately 10 minutes total per inch of thickness, if you are looking for a medium rare doneness. This would mean flipping them at the halfway mark. The next step is crucial. Let your steaks rest! If you cut into them as soon as they get off the grill, all of the flavourful juices will seep out onto the plate/cutting board and you will be left with a dry cut of meat. Once removed from the grill, immediately place the steaks on a clean surface and tent them with tin foil so that they stay warm. They should rest for about 5 minutes before serving. Serve the perfectly grilled steaks alongside the red wine sauce. Now marvel in your achievement.